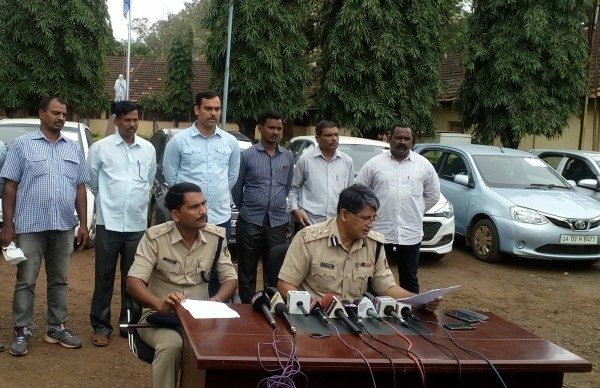 City Crime Branch arrested two men for inter state vehicle theft cases in Goa and as many as 37 cars all GOA passing were seized by the sleuths of CCB, Belagavi. Naveed Najifali Qatib (39), resident of Kalmath Road in Belagavi city, and Parashuram Mantappa Kumbar (28), native of P.N. Gonal in Muddebihal taluk of Vijayapura district were spotted suspiciously moving in the early hours. B.R. Gaddekar Inspector of the crime branch after getting a tip-off intercepted and duo early morning. The police said the duo confessed to have stolen the car from Goa, apart from nearly 40 cars and jeeps in Goa by theft and cheating. They used to come to Belagavi to lease the same vehicles for 1 lakh or two lakhs.